Obama also opposes voter ID laws. He believes they disenfranchise voters. Last year, Obama put a hold on the nomination of Hans von Spakovsky for a seat on the Federal Election Commission. It seems von Spakovsky, as an official in the Justice Department, had supported a Georgia photo ID law. Acorn espouses the leftist view that voter ID laws are racist. In addition to subverting American democracy to promote a leftist agenda, Acorn's radical agenda amounts to "undisguised authoritarian socialism." wrote Sol Stern in the 2003 City Journal article, "Acorn's Nutty Regime for Cities." . . . Here is the problem. The Portable People Meter is considered more accurate than the traditional diaries that people used to use because it actually measures whether people are in the room watching the show. Apparently, African-Americans were claimed to watching shows at much higher rates than they actually were. To prevent the use of this more accurate measure, New York State Attorney General Andrew Cuomo has filed a lawsuit. New York State Attorney General Andrew Cuomo filed a lawsuit on Friday accusing Arbitron Inc, the largest ratings company for radio in the United States, of false advertising and deceptive business practices. Cuomo's office said in a statement that the lawsuit accuses Arbitron "of deceptively claiming that its Portable People Meter system is valid, fair, and representative of diverse radio markets." . . . Published: Friday, October 10, 2008 at 2:13 p.m.
Last Modified: Friday, October 10, 2008 at 2:19 p.m.
Newlyweds David Hall and Krista King of Wilmington are among thousands of people in Southeastern North Carolina arming themselves with handguns for protection and doing it legally. From Dec. 1, 1995, when it became legal to carry a concealed handgun in the state, until July 31 of this year, sheriff’s offices in Brunswick, New Hanover and Pender counties received 8,167 permit applications. The state total was 225,762 for the same time period. The purpose of the law that allows North Carolinians to carry concealed handguns is to deter crime, said Richard White, a former Boiling Spring Lakes police chief and current investigator with the New Hanover County Public Defender’s Office. “I’m a firm believer in it because it is a deterrent to crime,” White said of the law. . . .
Did Obama interfere with US-Iraq negotiations? Some of the specifics of the conversations remain the subject of dispute. Iraqi leaders purported to The Times that Mr. Obama urged Baghdad to delay an agreement with Mr. Bush until next year when a new president will be in office - a charge the Democratic campaign denies. Mr. Obama spoke June 16 to Foreign Minister Hoshyar Zebari when he was in Washington, according to both the Iraqi Embassy in Washington and the Obama campaign. Both said the conversation was at Mr. Zebari's request and took place on the phone because Mr. Obama was traveling. However, the two sides differ over what Mr. Obama said. "In the conversation, the senator urged Iraq to delay the [memorandum of understanding] between Iraq and the United States until the new administration was in place," said Samir Sumaidaie, Iraq's ambassador to the United States. . . .
CLEVELAND - A man at the center of a voter-registration scandal told The Post yesterday he was given cash and cigarettes by aggressive ACORN activists in exchange for registering an astonishing 72 times, in apparent violation of Ohio laws. "Sometimes, they come up and bribe me with a cigarette, or they'll give me a dollar to sign up," said Freddie Johnson, 19, who filled out 72 separate voter-registration cards over an 18-month period at the behest of the left-leaning Association of Community Organizations for Reform Now. "The ACORN people are everywhere, looking to sign people up. I tell them I am already registered. The girl said, 'You are?' I say, 'Yup,' and then they say, 'Can you just sign up again?' " he said. Johnson used the same information on all of his registration cards, and officials say they usually catch and toss out duplicate registrations. But the practice sparks fear that some multiple registrants could provide different information and vote more than once by absentee ballot. . . .
UPDATE: Despite this massive evidence of vote fraud, the 6th US Circuit Court of Appeals set aside a lower court judge's order "that Democratic Secretary of State Jennifer Brunner institute the means to verify voter registration information and make it available to Ohio's 88 county election boards." "Gardener Ordered to Remove Barbed Wire Fence on Grounds It Could 'Wound Thieves'"
Britain is a weird place with knife control and penalties for some people who act to protect their lives and property. Here is another example that some Americans might find a little strange. A British gardener’s local council has ordered him to remove a 3-foot high barbed wire fence around his property in case thieves hurt themselves on it, the Daily Mail reported Thursday. Bill Malcolm, 61, installed the wire at his Worcester property after burglars robbed his tool shed and vegetable plots three times in four months, stealing more than $500 worth of hardware. But Malcolm’s local council told him the wire was a health and safety hazard and warned him they would remove it by force if he did not do it himself, the Mail reported. The council said that a fence on the property must be a post or rail fence, not barbed wire. “With regard to the barbed wire, when this is identified on site, we are obliged to request its removal or remove it on health and safety grounds to the general public as this is a liability issue,” a council spokeswoman told the Mail. Supposedly Obama sought and received the Socialist party endorsement when he ran for the state Senate in 1996. Barack Obama was an active participant in the 1990s, and a direct political beneficiary, of the Chicago New Party and, importantly, the Chicago DSA, a group of socialists affiliated with the Democratic Socialists of America. 1) Barack Obama attended and participated in meetings of the Chicago New Party and the Chicago DSA, the local affiliate of the Democratic Socialists of America. 3) Barack Obama actively used the endorsement from the Chicago DSA. 4) Barack Obama won his DSA-endorsed and -backed campaign to secure his seat in the Illinois State Senate. 5) Barack Obama continued his involvement with the Chicago DSA — including directly asking the group to join “his task forces on Voter Education and Voter Registration” — and received their endorsements in subsequent campaigns. I have no independent verification of this being true, though whether this particular story is true, Obama is a very socialistic person. Few people realize how much of the present damage to markets is caused by the new regulations imposed by Sabannes Oxley and the “mark to market” rules imposed by FASB. How do you mark to market when there is no market? The market for troubled loans has dissolved for two reasons: no one knows what they are worth, and if an investment bank takes the loans into its portfolio it must mark them at the market price. The market is illiquid and facing not mere risk. They are facing uncertainty. No one knows what the values are or what the probabilities are. . . .
My own belief is that the Brits who put this survey together are a little bit biased towards their own country. For example, if a student were asking whether they should go to Princeton or the University College of London, I don't think that it would be a close call, but they say that for most degrees you should pick the later. I might be interesting to compare their ranking for US schools against other rankings for US schools because I would guess that they won't match up very well. For whatever it is worth, in my own small area of expertise, the best UK school regarding economics is the London School of Economics, and they do have some very good people there. But the LSE is ranked well down at 66th. How does the US rank in terms of Competitiveness? How two campaigns are run. My guess is that the Obama campaign feels that they can get away with a lot because the press cares so much for him, but in any case since Obama says that you can judge his managerial abilities by looking at his campaign, this might be useful to look at. The Obama aides who deal with the national reporters on the campaign plane are often overwhelmed, overworked and un-informed about where, when, why or how the candidate is moving about. Baggage calls are preposterously early with the explanation that it's all for security reasons. If so, I would love to have someone from Obama's campaign explain why the entire press corps, the Secret Service, and the local police idled for two hours in a Miami hotel parking lot recently because there was nothing to do and nowhere to go. It was not an isolated case. The other day in Albuquerque, N.M., the reporters were given almost no time to file their reports after McCain spoke. It was an important, aggressive speech, lambasting Obama's past associations. When we asked for more time to write up his remarks and prepare our reports, the campaign readily agreed to it. They understood. Similar requests are often denied or ignored by the Obama campaign aides, apparently terrified that the candidate may have to wait 20 minutes to allow reporters to chronicle what he's just said. It's made all the more maddening when we are rushed to our buses only to sit and wait for 30 minutes or more because nobody seems to know when Obama is actually on the move. . . . Here the National Taxpayer's Union estimates for McCain (+$92 Billion/year) and Obama (+$293 Billion/year). A $200 billion difference in spending is pretty big difference. 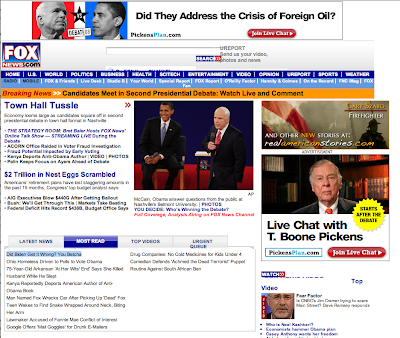 Newsweek bias against Sarah Palin? Why is their cover picture of Palin the first one that they have done in years where they haven't retouched the photo? Why did they retouch all the photos of Obama, but not Palin? Here is the debate. Nearly 1 in 6 Home Owners 'Under Water'? : Is this possible? About 75.5 million U.S. households own the homes they live in. After a housing slump that has pushed values down 30% in some areas, roughly 12 million households, or 16%, owe more than their homes are worth, according to Moody's Economy.com. The comparable figures were roughly 4% under water in 2006 and 6% last year, says the firm's chief economist, Mark Zandi, who adds that "it is very possible that there will ultimately be more homeowners under water in this period than any time in our history." Among people who bought within the past five years, it's worse: 29% are under water on their mortgages, according to an estimate by real-estate Web site Zillow.com. . . .
After Democrat Barack Obama does battle with Republican John McCain tonight, a prominent Obama supporter is scheduled to pop up in the post-debate ad breaks, stating his opposition to pro-union legislation that enjoys the backing of Obama and Democratic leaders. George McGovern, the 1972 Democratic nominee and now a venerated party elder, appears in minute-long ads by the Employee Freedom Action Committee, which is using criticism of the Employee Free Choice Act as a club to beat on Democratic Senate candidates in several states. . . .
Rendell getting some well deserved blame here. Critics of Pennsylvania's parole system are saying it is dysfunctional to the point of being scandalous - and fingers are pointing at Gov. Ed Rendell. "We have carnage on the streets from violent offenders who should have been in prison. Instead of addressing the problem and keeping the streets safe, it appears that Pennsylvania may have put in an "express lane" for parole in our state," said John McGrody, vice president of Philadelphia's local Lodge 5 of the Fraternal Order of Police. . . .
Why won't Obama just hand over his birth certificate? (Lafayette Hill, Pennsylvania – 10/06/08) - Philip J. Berg, Esquire, the Attorney who filed suit against Barack H. Obama challenging Senator Obama’s lack of “qualifications” to serve as President of the United States, announced today that Obama and Democratic National Committee [DNC] filed a Joint Motion for Protective Order to Stay Discovery Pending a Decision on the Motion to Dismiss (which was) filed on 09/24/08. While legal, Berg stated he is “outraged as this is another attempt to hide the truth from the public; it is obvious that documents do not exist to prove that Obama is qualified to be President.” The case is Berg v. Obama, No. 08-cv-04083. Their joint motion indicates a concerted effort to avoid the truth by attempting to delay the judicial process, although legal, by not resolving the issue presented: that is, whether Barack Obama meets the qualifications to be President. It is obvious that Obama was born in Kenya and does not meet the “qualifications” to be President of the United States pursuant to our United States Constitution. Obama cannot produce a certified copy of his “Vault” [original long version] Birth Certificate from Hawaii because it does not exist. UPDATE: I just want to emphasize what I wrote earlier: "Indeed, I feel as if this whole thing is some type of setup to make critics look like kooks right before the election." I really worry that this is a type of trap to discredit and demoralize those who oppose Obama. UPDATE 2: For whatever it is worth, here is a rather long rambling discussion from the lawyer who has brought this lawsuit against Obama. I had no confidence before with this guy, and I have no more confidence with him after listening to this. My only questions are: What motivated this guy? Was he in league with the Obama people? (It is about one crazy thing that would explain why Obama wouldn't turn over his birth certificate.) Or was he simply a prominent Dem who went a little crazy? I don't know, but the whole thing seems very strange to me. First let me say that I think that this is a silly question. I also think that Couric's answer here is just as useful as Palin's. The youtube click combines Palin's response about getting back that was an answer to another question and this youtube clip creates a very misleading impression because of that. Reporter: What magazine and newspapers do you read? Couric: All of them and any of them. For the first time, Barack Obama's campaign is contending that its candidate "didn't know the history" behind William Ayers, the unrepentant member of the terrorist Weather Underground, when Mr. Ayers' hosted a key event at his Chicago home that launched Mr. Obama's political career in 1995. "When he went, he certainly didn't know the history" behind the bombs that Mr. Ayers helped set, chief Obama strategist David Axelrod told CNN yesterday. "There's no evidence that they're close," he concluded, even as reports of their contacts over the years continue to mount. For his part, Mr. Obama told radio host Tom Joyner yesterday that Mr. Ayers "engaged in these despicable acts 40 years ago when I was 8 years old. I served on a board with him." So why is the Saturday Night Live Sketch making fun of Democrats removed from all the websites? One of the funniest and most politically searing comedy sketches in years has vanished from the Web site of NBC's Saturday Night Live. Visitor comments asking about its disappearance are also being scrubbed from the Web site. The sketch -- a harsh indictment of the housing meltdown that led to last week's bailout bill -- was clearly too much truth for someone to handle. Then SNL comic Kristen Wiig, playing Speaker Pelosi, introduces a parade of "victims" of the housing crisis. These "real Americans" include two jobless deadbeats who bought houses with no down-payment and a preppy couple who can't flip the dozen time-share condos they bought as a speculative investment. They were followed by actors portraying the real-life couple of Herbert and Marion Sandler. They explained how they built a mortgage company that specialized in subprime mortgages, which they sold to Wachovia Bank for $24.2 billion in 2006 -- one of the worst acquisitions by any company ever. It helped precipitate the collapse of Wachovia last week. The Sandlers were hustled off the stage by "Speaker Pelosi" after they said they couldn't understand why they were invited to a news conference of "victims" since they had done so well out of the housing crisis. They were followed by financier George Soros, identified as "Owner, Democratic Party." The actor portraying Mr. Soros informs the group that the $700 billion bailout package "basically belongs to me" and that he has decided to short the U.S. dollar. That will trigger a devaluation "either Tuesday or Wednesday. I haven't decided which yet. It will depend on how I feel." The brutally wicked sketch must have caused tremors in left-wing circles. The Sandlers and Mr. Soros have all been prime financial backers of independent political groups that have secured huge influence in the Democratic Party and helped fuel the rise of Barack Obama. . . . Thanks to a reader of this blog in the comments section I was pointed to this link here for the video. Well, if customers wanted these easily removable batteries enough, if they wanted that feature more than the cost of providing it, you would think that Apple would provide it. Instead, customers seem to be flocking to the Apple iPod. The customers seem to like the small size and lightness more than having easy access to the battery. In any case, that apparently isn't stopping the EU government regulators from deciding that the customers don't know what features they really want on these products. The European Union is preparing new directives that could have an impact on Apple's future products, including "the New Batteries Directive," which proposes to mandate that batteries in electronic appliances be "readily removed" for replacement or disposal. The EU has taken the lead in pushing for industry regulations that impact all companies that sell their products in Europe. For example, the Restriction of Hazardous Substances Directive, known as RoHS, demanded tough new limits to the use of lead, mercury, cadmium, hexavalent chromium, and flame retardants known as PBB and PBDE. . . .
Of course, during the warranty period Apple will replace the battery for you at no additional charge. If you want to extend your warranty people are free to do so. John Kass is someone who knows where all the bodies are buried. The national media have never wanted to understand, much less expose, political corruption here, or examine how Obama prospered under the Daley machine's guidance. A trip down the Chicago Way would force them to re-examine their ridiculous narrative that sets Obama as a political reformer riding a white horse, or is that a winged unicorn? How, for example, could change agent Obama endorse the boss of the Chicago machine, Mayor Richard Daley, after Daley's friends and drinking buddies, white guys with mob connections, received $100 million in city affirmative action contracts, a crime that sent one of them to federal prison? The mayor said there is no such thing as a machine. Does Obama truly believe there is no machine that runs Chicago and Cook County? Then he should declare it. And, if so, then how does he explain the Daley hacks sitting in federal prison for rigging thousands of city jobs? McCain could ask about the machine trolls Obama endorsed per Daley's direction. And what of Obama's own political mentor, the legendary city sewer inspector/Illinois Senate President Emil Jones (D-ComEd), who upon retirement will convert almost $600,000 in campaign cash and stuff it into his pockets, and begin cashing a fat public pension, as his son, Emil III, takes Daddy's place in the legislature, courtesy of the Democratic bosses. Is this the change we've been waiting for? McCain could ask about Obama's real estate fairy, the convicted influence peddler Tony Rezko, who is now apparently cooperating with federal investigators probing the dealings of Democratic Gov. Rod Blagojevich, who also campaigned as a reformer. Rezko is scheduled to be sentenced Oct. 28. How was the Rezko-Obama real estate deal, the one that Obama himself described as "boneheaded," never made a subject of a Senate Ethics Committee investigation? . . . . Chilling account of fruitless 911 call. "I never voted before," Woods said, because of a felony conviction that previously barred him from the polls. "Without this service, I would have had no way to get here." I will be on the Ellis Henican Show at 10:20 in the morning to discuss the bailout. His show is on SIRIUS 110. The Key to human evolution: Men older than 50 having children? Human evolution is grinding to a halt because of a shortage of older fathers in the West, according to a leading genetics expert. Fathers over the age of 35 are more likely to pass on mutations, according to Professor Steve Jones, of University College London. Speaking today at a UCL lecture entitled “Human evolution is over” Professor Jones will argue that there were three components to evolution – natural selection, mutation and random change. “Quite unexpectedly, we have dropped the human mutation rate because of a change in reproductive patterns,” Professor Jones told The Times. “Human social change often changes our genetic future,” he said, citing marriage patterns and contraception as examples. Although chemicals and radioactive pollution could alter genetics, one of the most important mutation triggers is advanced age in men. This is because cell divisions in males increase with age. “Every time there is a cell division, there is a chance of a mistake, a mutation, an error,” he said. “For a 29-year old father [the mean age of reproduction in the West] there are around 300 divisions between the sperm that made him and the one he passes on – each one with an opportunity to make mistakes. “For a 50-year-old father, the figure is well over a thousand. A drop in the number of older fathers will thus have a major effect on the rate of mutation.” . . . When you apply for a job the first rule for the interview is to know what the job is. Senator Joe Biden failed that test last Thursday. He couldn’t even get right what it is a vice president does. The media is all over itself about how smart and experienced Biden is. Political Analyst Charlie Cook is quoted in the Washington Post on Saturday as saying “Biden is clearly so much more knowledgeable, by a factor of about a million.” Saturday Night Live does a skit about Biden being smart, if slimy. Meanwhile, Governor Sarah Palin is treated as being nothing more than a simpleton. Yet, take Biden’s statement from the debate on the role of the vice president: . 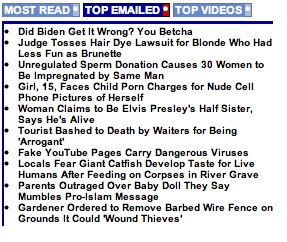 . .
One neat item of news, my article is now the most read piece on Fox News today. It was also the top emailed piece at Fox. UPDATE: On Thursday, 3 days after it was placed on the website, it is still the most read and most emailed piece on Fox. Who should get the Nobel Prize for Economics? Josh Wright has this post pointing to why Armen Alchian and Harold Demsetz should get the prize. The teacher who got his students to do this was suspended. I found this scary stuff. If the link doesn't work, try this. TRUMP: I really don't know Senator Biden but I know one thing. He's run a number of times for president. He's gotten less than 1 percent of the vote each time. And that's a pretty tough thing. You know, he's also been involved in pretty big controversy like plagiarism in college and various other things. That's a pretty big statement. So perhaps you change over a period of time. But when you plagiarize, that's a very bad statement. That hasn't been brought up yet, but I'm sure at some point it will. I'm sure that Sarah Palin will bring it up in a debate or somebody's going to bring it up. BLITZER: Are you talking about plagiarism when he was running for president? TRUMP: No, I'm talking about when he was a college student as I understand it, and this was a big issue originally but he supposedly plagiarized as a college student. That's a pretty serious charge. BLITZER: I don't remember that. We'll check it out. But maybe you obviously have a better memory about that. I bring this up because when I wrote a recent piece that discussed the differential news coverage that Biden and Palin received when they were nominated, some mentioned that the reason virtually none of the news stories mentioned any past problems that Biden had was because they were so well-known.